Lathem 7500e Employee Time Computer Clock. Automatically Calculates and Totals employee's hours for up to 100 Employees. Buy from Time Clock eShop.com and save. 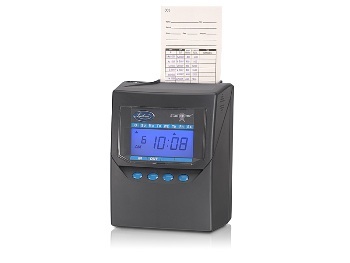 This Employee Time Computer Clock Calculates Hours Worked-Ideal for Payroll or Job Costing. Receive Atomic time signal from the WWVB atomic clock in Fort Collins, Colorado.